tL;dr A few heavy coats of Cord-Fix work better than multiple thin coats. It’s October now and Cord-Fix has just finished it’s third month of sales on Amazon. Woohoo! We never expected to be selling so well, so early in the game. While there’s still a long way to go, so far it’s all systems go. Reading Amazon customer reviews for Cord-Fix been an especially eye-opening experience for us. In this post, I want to discuss a common remark among some reviewers about the number of coats of Cord-Fix needed to effectively repair a frayed charger cable. Two reviewers have commented that it took 5 coats to get results, and a third said it took “multiple” coats. Clearly I don’t know their details, but for a typical fray, that seems like a lot of coats to me. Our instructions recommend at least two coats to insure complete coverage, but we’ve repaired simple frays with just one coat. Even difficult frays are usually fixed with 3 coats. So why the difference in user experience? I think it has to do with the way it’s applied. Because we here at Cord-Fix Labs are so used to working on frays, we are not dainty when we brush it on. We load up the brush and generously apply the material to the area, sometimes using 2 or even 3 drops, which is a lot. In other words, we lay it on thick! 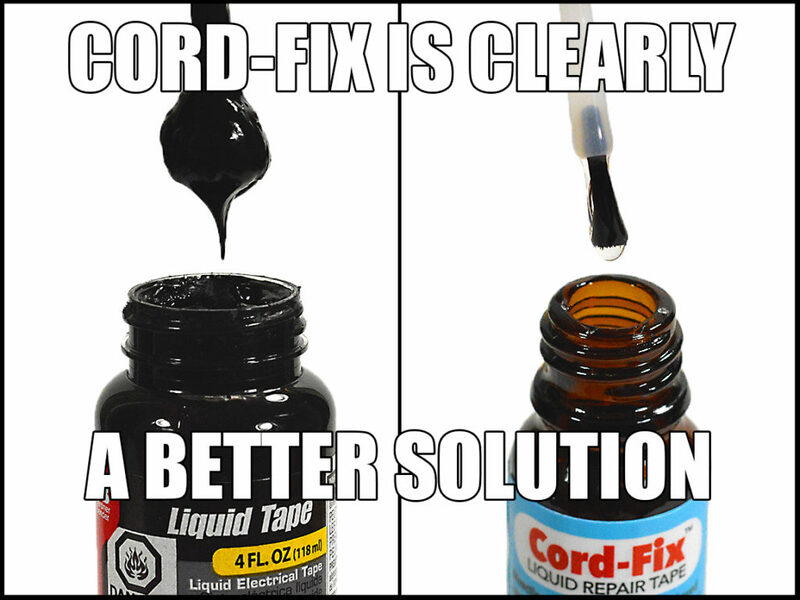 Cord-fix has a consistency similar to thick nail polish. With nail polish, however, you typically wipe any excess liquid off the brush onto the inside of the bottle, so you can put down a thin, even coat onto the nail. But that same thin-coat technique doesn’t work as well when making a repair with Cord-Fix. Instead, the goal is to saturate the frayed area so that the liquid gets into all the gaps, and encapsulates the exposed wires. You’re literally adding a new cover to the wire. So you want to lay down a generous amount of material. What’s the right amount for a coat? That depends on the size of the fray. But a good rule-of-thumb is just enough so that it doesn’t drip off the wire. Put on a drop, maybe two, and brush it into the fray. If the material starts to gather into a drip along the cord, quickly use the brush to move it back around the fray’s surface. Fill the gaps and cover the fray in its entirety all around the cable. This technique works because Cord-Fix dries so fast. In just a few minutes the liquid is set. In about 5-10 minutes it’s dry enough to add a second coat. This second coat should also be applied as thickly as possible, perhaps going a little further along the top and bottom of the first coat to really cover the repair. Allow to dry and then use your judgement to decide if any more coats are needed. Every fray is different. If it weren’t for the Amazon reviews, we would never have seen that our instructions on how to apply Cord-Fix need to be more specific. Thank you Amazon for helping us to improve the customer experience. Now we know to tell our customers to really lay it on thick! Imagine a roll of black electrical tape left on a hot sidewalk to melt, then scooped up and poured into a bottle. That’s liquid electrical tape. OK, not really, but it’s kind of a hot mess. This is the kind of stuff an electrician might use to cover some exposed high-voltage wires in a boiler room, where making a mess doesn’t matter. Or a radio technician might use to secure a cable transition to a roof connection. It’s perfect for a stationary industrial application, meaning one that doesn’t move. Which leads me to point number 2. Charger cables, USB cords, and most other low voltage cables are dynamic, always in motion, always under stress from the user. They are tugged, pulled, wrapped, stuffed, pushed, and generally take a pounding in everyday use. That’s why they fray. When I tested liquid electrical tape, the results were poor. The stuff adhered ok at first, and I thought I’d found my solution. But the results weren’t durable. The liquid electrical tape didn’t stay stuck and very quickly the repairs I made with liquid electrical tape began to peel off the cords. It just didn’t work very well. Cord-Fix does what liquid electrical tape can’t. 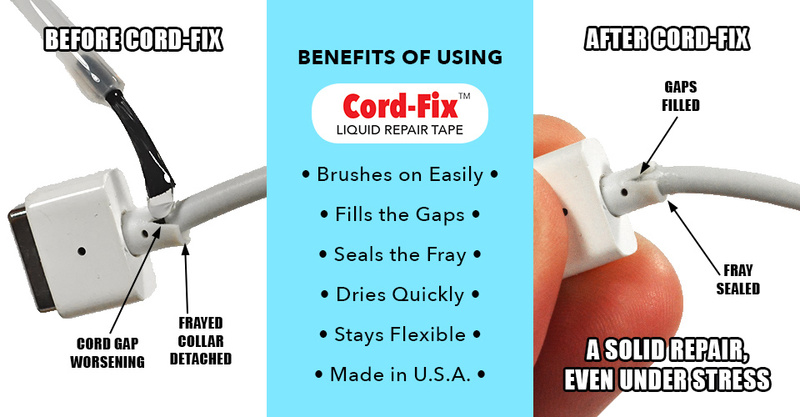 Cord-Fix goes on easily, adheres strongly, and stays flexible. 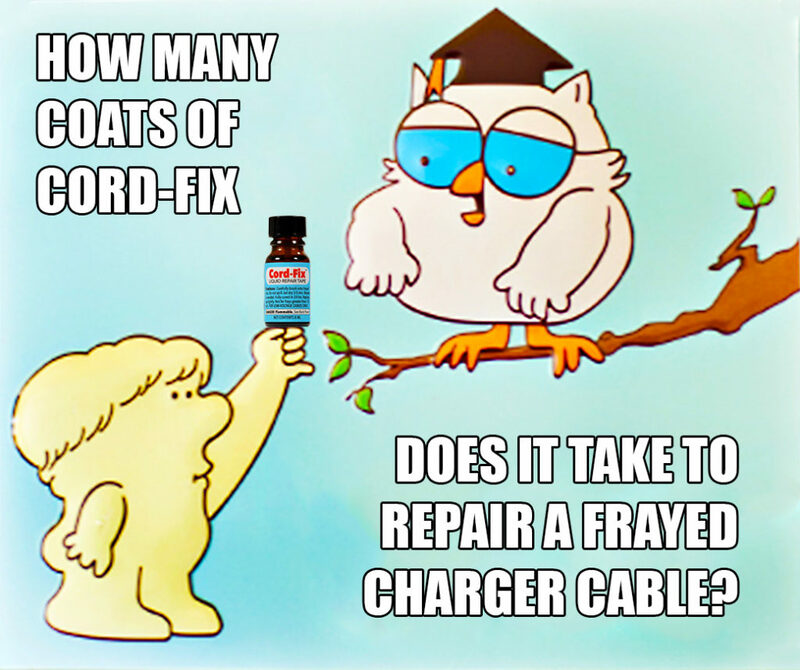 For repairing low voltage charger cables, Cord-Fix is clearly a better solution. Website v2.0 is now live! I can admit it now – the first design version of Cord-Fix.com needed some help. Some of you are probably nodding your head in agreement. It was not exactly cutting edge. Totally my fault, as I was determined to figure out how to design it myself, and clearly I was (and still am) not a trained web designer. But look at Cord-Fix.com now! The design upgrade is looking pretty sweet, if I do say so myself. The home page has been completely redesigned to be fully responsive, which is tech-speak meaning that the page size automatically resizes for any size screen, including for mobile devices. It has an explainer video. It has info graphics. It has Call To Action buttons. Woo hoo! A big help in the redesign was that I already had a color scheme based on the logo, labels and packaging that I’d previously developed. As a fine art photographer, I am also able to create and manipulate my own photo files, which is a huge benefit. And as a longtime WordPress abuser, I had the skill set to at least improve on the previous version. Also, kudos to my WordPress theme from Generatepress.com. It provided me with a good, stable starting place from which to attempt my vision. Design-wise, my focus was to tell the very simple story of Cord-Fix. I’ve designed a lot of marketing materials, and am a big believer in the “maxi-marketing” school of Thomas Collins (with whom I also had the pleasure of having lunch once long ago). So the headline has one job – to help a reader to quickly and easily decide if my product can solve their problem. A question is a great way to do that. “Charger cable fraying?” together with a picture of frayed USB cords is the story in a nutshell. Yes, I know that more improvements are needed, and that very soon I will be working on Cord-Fix.com v3.0. But for now, the site is looking mighty fine, IMHO. 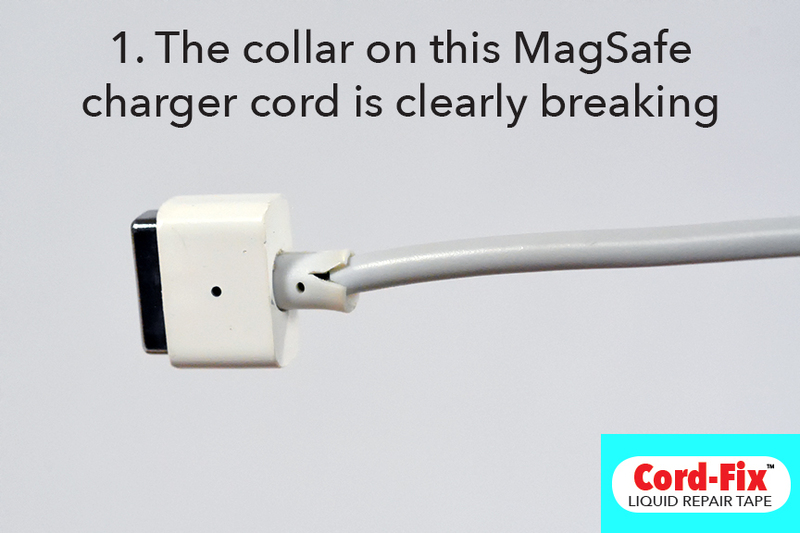 Just like maintaining your good health, early detection is the key to maintaining a charger cord’s good condition. As soon as you see any sign of cracking or breakage in the cable’s outer skin, you should immediately apply a layer of Cord-Fix around the break. Sometimes, though, there is no warning when a fray will start. In the blink of an eye, your perfectly fine charging cable can become seriously frayed. And that’s ok. It happens. Just apply Cord-Fix ASAP to easily mend the frayed area, and carry on. Other times, though, you can see it slowly begin. A tiny crack appears in the vinyl cover. or in the tiny flange joint between the cable and the connector. It just happened to me. My first instinct? I ignored it, which is hilarious because I’m Mr. Cord-Fix himself! A tiny crack appeared, and for a week I did nothing, too busy to be bothered, or tbh just too lazy. Sigh. But after about a week, the crack had expanded far enough so that I could actually see some bare wire underneath the cord cover. That’s not good. Why? In my experience, once the vinyl cord cover starts peeling off, those bare wires are at risk for breakage and permanent damage. Cord-Fix can repair a fraying cable, but it can’t make a non-functioning cord functional again. Without its protective outer covering, that cord is eventually going to break, and probably soon. As this was a MagSafe cable that I use for charging my MacBook Pro, I REALLY didn’t want to spend the big bucks an a replacement cord.Those MagSafe laptop charging cords are super expensive. Even though this one was a non-Apple generic charger cord, it was still nearly $40. No thanks. But the same goes for any kind of low-voltage, vinyl-wrapped cord, like those for mobile or smart phone chargers, laptop, and even game controller cords, headphone and earbud cables. 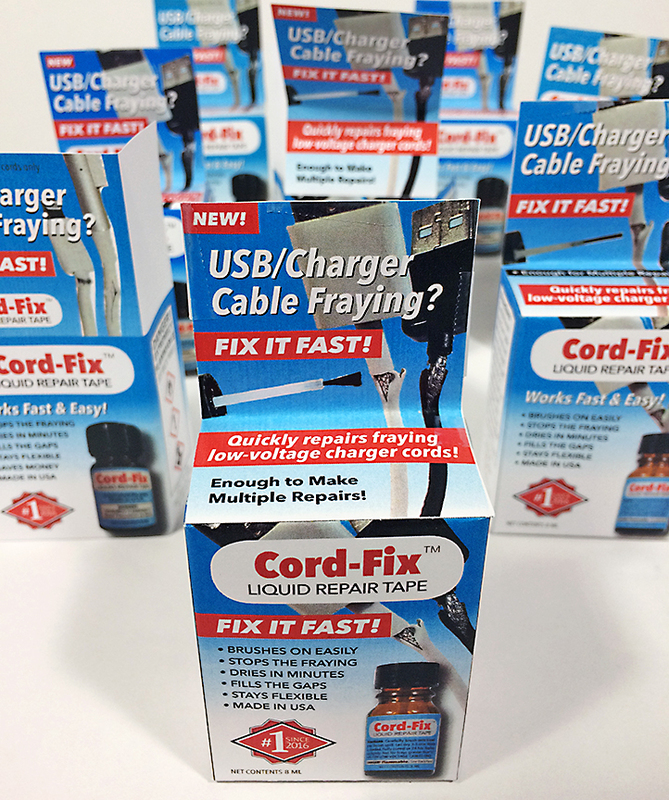 Cord-Fix prevents any low-voltage cable from fraying. And it worked. Cord-Fix quickly filled the gaps, sealed the break, and stop the fraying. And it stayed flexible. Will it need another coat? Possibly, but for now the problem is solved and my charger cord is repaired. Yay! 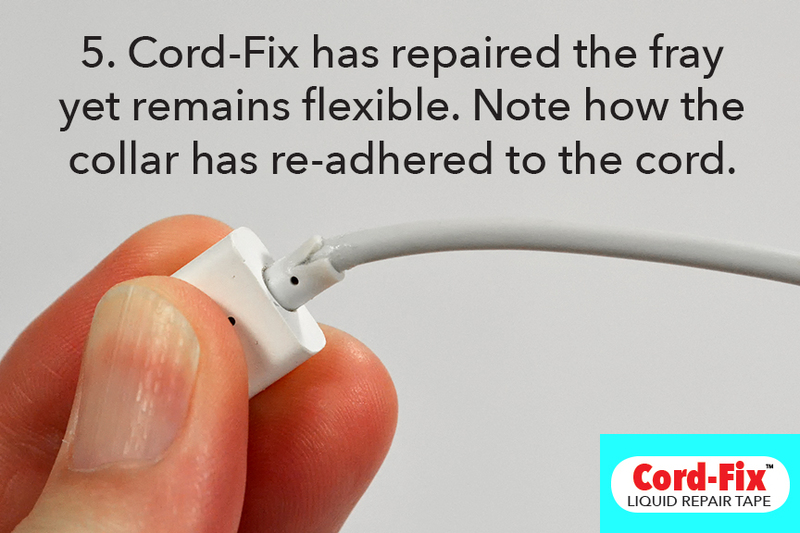 Cord-Fix acts like scar tissue to make repairs that are strong and durable. The ugly truth is that Cord-Fix repairs are, well, ugly. Cord-Fix is my baby, and it does the job better than anything else on the market. Cord-Fix not only repairs your fraying charger cables and USB cords, but it can keep them working long beyond their expected life span. That’s good for your wallet, and it’s good for the earth, because it keeps cables in use, rather than in the garbage. But even I must admit that the repairs that are made with Cord-Fix are not beautiful. Honestly, that’s why I haven’t published a lot of post-repair pictures. Cord-Fix leaves bumps. It cures somewhat translucent to milky-ish, depending on how many coats are used for a repair. The wires are sometimes still visible beneath the repair. Personally, I like to think of the breaks and frays as flesh wounds in the cable, from the daily pounding that our personal electronics get from us. 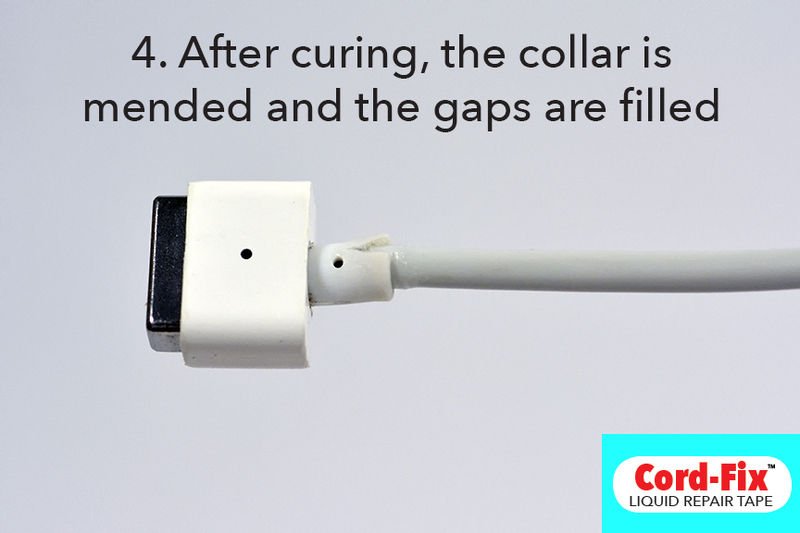 Cord-Fix is like scar tissue! You just brush it onto the cable’s “wound” and it gets a layer of healing scar tissue. Cord-Fix literally becomes new plastic “tissue” that fills in where the old covering has broken away. Since scars can be beautiful, maybe it’s time for me to embrace the scarring that my battle-worn cables have gotten. In that spirit, here is a photo of my oldest Cord-Fix repair. This is a generic lightening cable that I use nightly by my bedside. Without Cord-Fix, it would have been tossed long ago. Instead, it keeps me charged and ready to go, night after night. It’s not frayed. It’s fabulous! This week’s job at Cord-Fix HQ is designing the retail package. I find packaging to be quite fascinating on many levels. Packaging is a big deal. Very few products are sold without packaging, which means enormous effort and resources are spent on creating beautiful outer containers for inner goods. Packaging protects, displays, delivers, entices, and virtually represents the products held within. Yet once the item is purchased, the packaging is tossed away without a thought. It’s an annoyance. Waste. It goes into our bins and receptacles and our landfills. As an artist, I’ve literally spent years exploring the hidden beauty of packaging materials. But until now I’ve never actually designed a package for a consumer product before. So I’m having fun. My first idea for a package for Cord-Fix was a blister pack. I like blister packs. They have two components: the clear three-dimensional blister that holds and displays the item, and the colorfully-printed card that backs the blister and also provides a surface for images and copy. You’ve seen blister packs many times. They are designed to hang from pegs, and are well suited for smaller objects. Best of all, the product is clearly visible right through the nearly invisible blister. Cord-Fix will probably end up being packaged in blister packs in the near future. But for now, I’m going with a paper box with a hang tag. That way it can be either hung like a blister card, or stood up on a shelf. And I can do all the packaging and assembly in-house with no additional tools, which makes it perfect for a start-up like Cord-Fix. Assembling blister cards requires some specialized machinery. With that decision made, the actually design can begin. An effective display box needs bright colors, crisp images and compelling words in order to catch the harried consumer’s busy attention. So that’s the current task, to make an eye-catching package that speaks exactly to the person who is wondering how to fix a broken charger cable or how to repair a frayed USB cord. The image above is where I’m at right now. This is just the front panel of the box part; there’s an additional hang tag panel that will extend upwards with more content, plus top, bottom, side and back panels, all with content. It’s a work in progress. The copy is a bit awkward still. The image clearly needs color-correcting, and I’m not sure about that drop shadow. The digital file itself is a melange of different formats. Sigh. But, check out that awesome badge. Cord-Fix is #1 since 2016 — that’s true, hilarious and ironic all at the same time! Plus, it’s a completely original design of my own. That badge is truly #1. But, I just realized there’s a big problem with this design: the image of the bottle has my v1.0 label. There’s a v2.0 label that I’ve created, but haven’t ordered yet. So clearly this design can’t be finalized until I get the new labels. Argh. So that’s next. Now I’m off to get my new labels moving forward. Gotta go. Bye! Should I change the Cord-Fix tag line to better suit SEO? 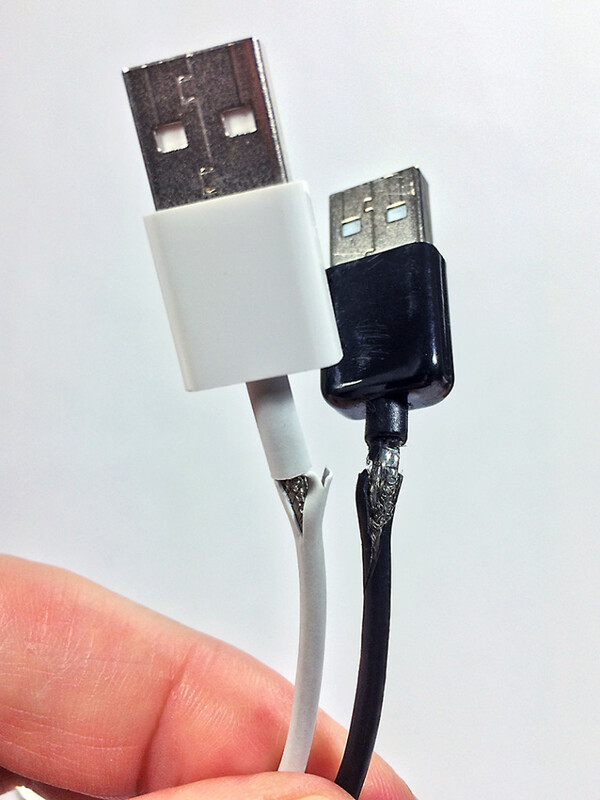 Not too long ago, I had an idea how to repair fraying iPhone and MacBook charger cables. It would quickly and easily brush on to the frayed part of the USB cord. It would dry fast, adhere permanently, and stay flexible under all conditions. Then, once I had developed the product, it needed a name. That was simple: Cord-Fix. The name explains exactly what the product does. When a customer wonders how to fix their charging cord, the answer is right there. Cord-Fix. Easy. But Cord-Fix also needed a tag line. This took me longer to figure out. I did a lot of research and had finally settled on “Liquid Repair Tape.” Why? I borrowed it from two other sort-of similar kinds of products. The first is often just called “liquid electrical tape.” It’s black goo that electricians brush onto bare wires in places that regular electrical tape is not practical. (Why you shouldn’t use it to fix your charger cords is the topic for another blog post,. For now, trust me, don’t.) The other is a product called a “liquid bandage” which is a mysteriously painful liquid that you brush over cuts. As with the aforementioned electrical product, it is used where a regular bandage wont work. That was the inspiration for Cord-Fix’s tag line of Liquid Repair Tape. But as recent readers are aware, I am also immersing myself in the world of keyword searches and search engine optimization. There’s a WordPress plugin called Yoast that I’m testing out, while also obsessively reading their blog on how to get customers to “beat a path to my door” so to speak. So I’ve been doing lots of keyword searching on Google to see where my product currently falls in the whole search engine universe. By the way, a lot of this SEO keyword stuff can be applied to searches on Amazon, where Cord-Fix is also available. But that’s a whole other world of fascinating confabulation. What I have discovered is that my keywords “cord” and “fix” are a pretty popular combination. That means that in my short time doing this, I’m not having much luck breaking into the first page of Google, which is the Holy Grail of all SEO managers. As I learn more about this world, and as I continually add content and improvements to Cord-Fix.com, my rankings will hopefully improve. The really cool discovery I made is the importance of my tag line in searches. Google search “Cord-Fix Liquid” and boom, my website, blog, and Amazon pages all appear in the first 20 results. Wow. That’s pretty okay for the new kid on the block. Having that third keyword somehow differentiates me enough to return superior search results. Now the question becomes, do I want this newly-discovered, all-important third word to be…”liquid?” If I don’t, then what do I want this third word to be? It still has to make sense in the context of a tag line for a variety of other marketing purposes. And be keyword search friendly and relevant. My current thinking is “repair gel,’ as in Cord-Fix Repair Gel should be my new tag line. Is this how it ends up, will Repair Gel be my new tag line for Cord-Fix? Keep tuning in and we’ll find out together. At least, that’s the legend, as attributed to American essayist Ralph Waldo Emerson. It’s since become the mantra of every entrepreneur: Innovate hard, create a great product, and the customers will start pouring in. But let me tell you, as I’ve discovered over my 30-year career as an entrepreneur, the reality is a little more complicated. Cord-Fix is easily that product. It’s truly a better mousetrap. If your USB cable is frayed, Cord-Fix will repair it quickly and easily. Everyone who tries it agrees: Cord-Fix works. The trick is getting people to see and learn about Cord-Fix! Getting a new product noticed by the public is a real challenge. The sheer amount of merchandise available for sale both in stores and online is staggering. Back in the 20th Century, it used to be that in order to tell consumers about your product and to drive demand, you advertised your product, either in print or via TV and radio. That’s what we called marketing in olden times. But the marketing world is vastly different now than it was back then, thanks to search engines like Google and merchants like Amazon. Today it’s all about keywords. What are keywords? Keywords are like descriptive breadcrumbs that somehow describe a specific aspect of your product, or of your target market, or of the problem it solves, or the solution it offers, and that web crawlers will follow to determine your worthiness of ranking within the vastness of search results. Keyword marketing is a kind of linguistic product deconstructionism. The marketer’s job is to break down their product into a cloud of words that somehow individually and collectively define that product’s place in the world. Each keyword is a piece of the product puzzle; put all the pieces together and viola, a product picture that will be easily served up to consumers via Google and Amazon. And that, folks, is why I’m here. I’m blogging my soul out to tell you to stop replacing your charger cords and buy Cord-Fix. Is your charger cable frayed? Do you want to fix your charging cord? Tired of spending money replacing broken USB cords? 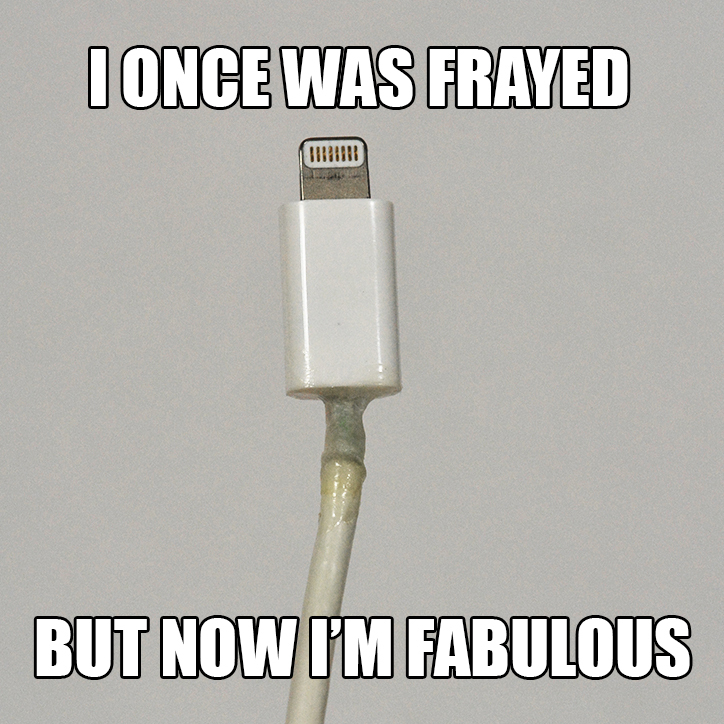 Want to repair your lightening cable for your iPhone, iPod, or iPad? 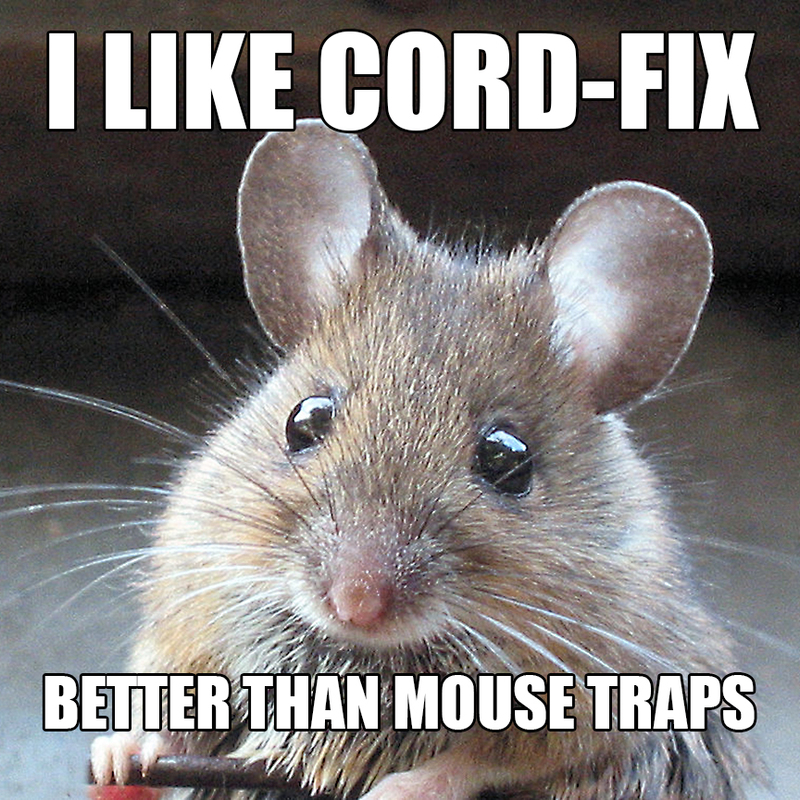 Then Cord-Fix is for you! There, did you see it? I just sprinkled you in key word fairy dust. Now, perhaps, the internet will notice. Cord-Fix is a brand new, easy way to fix those annoying frayed charger cords. iPhone users know exactly what I’m talking about, but it can happen to any frequent user of mobile computing devices such as laptops, tablets or other brands of mobile phones. Cord-Fix can easily repair these frayed charger cables. Photo © Cord-Fix. 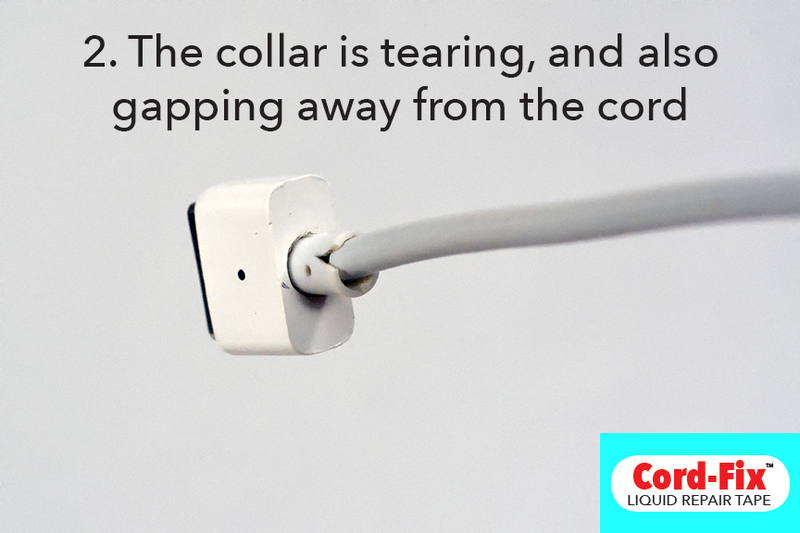 The fraying typically occurs at the junction where the cord meets the plug. This is the area where the charging cable gets the most stress, bending and stretching during daily use. The fraying pattern is fairly typical. First, the wire’s vinyl covering at the joint will begin to bulge. Then the cover separates from the plug, leaving a gap. Then, as the vinyl cord cover begins to peel away the wires inside become visible. Left unchecked, those now-exposed wires will soon snap. Once the wires themselves break, you will have to replace the entire cable with a new charger cord. The cord type doesn’t matter. It happens to USB cords, mini-USB cords, lightning cables, 30-pin cords, laptop charger cords and many other low voltage power cords. This same fraying or breaking also happens to headphones, ear buds, and game controllers. So stop replacing, and start fixing! 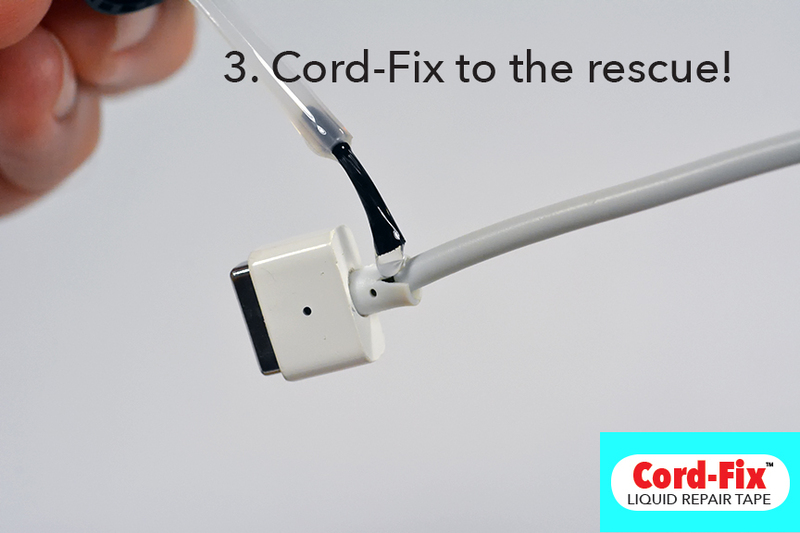 One bottle of Cord-Fix can repair up to a dozen charger cables, saving you the time and expense of having to buy replacement cords. 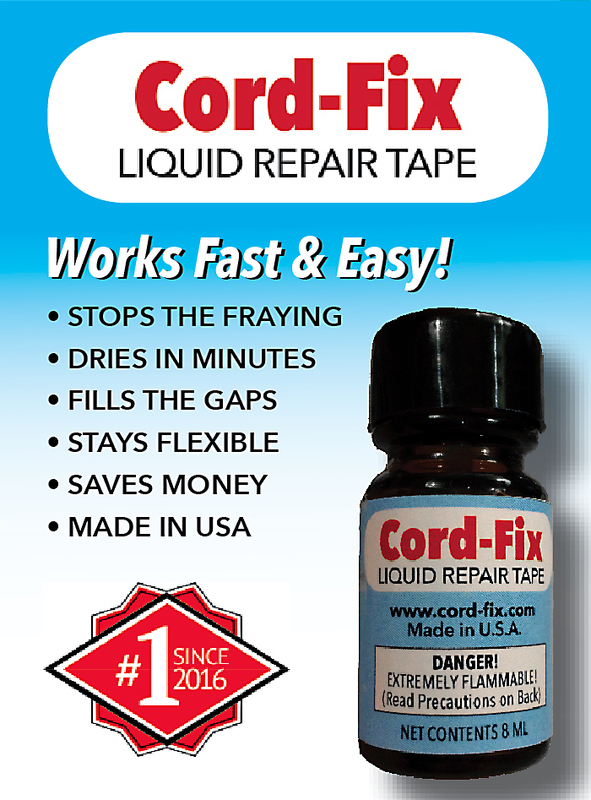 So order your bottle of Cord-Fix today. You’ll be glad that you did!